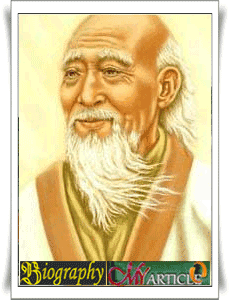 Lao Tzu, also known as, Laozi, Laosi or Laocius, was a philosopher of ancient China. Laozi is widely known because of the teachings of the Tao or Tao Te Ching. Because of the teachings of Laozi's lot is considered a forerunner of the emergence of Taoism. Born with the name Li Er and, originator of one of the most ancient schools in China's more known as Laozi as his work as a teacher. Childhood of Laozi is not well known because there are no written records of his lifetime except about his writings. Laozi, in his youth, is known as a keeper of the library of the High Court of Zhou. His work led him to be one who was fond of reading and learning. Laozi has access to a wide range of writings and teachings and many study various Sciences for serving as a supervisor of the library. Many people believe that while still in the Zhou, Laozi married and had a son who went into the ranks of military officers in the Kingdom. The State Government which deteriorated as a result of legal and moral issues of making Laozi decided to leave the Kingdom and wandering. Many historians noted Laozi travel to the West until the age of 160 years. On her travels, many reportedly met with Laozi the philosopher and theologian, one of the famous Siddartha Gautama. Laozi is rumored to raise followers from many different places are disinggahinya. One of his most famous is Yinxi. Laozi and Yinxi is considered to be the origin of Taoism's first demonstration made between teachers and their students. In addition to Taoism, Laozi taught astronomy, law and morals against his followers.